'We selected AVEVA PDMS as our preferred tool for 3D engineering design due to its ability to support global work sharing and AVEVA's ability to support us in our offices around the world,' explained Andreas Palmlund. 'This enables Pöyry to work with the most advanced 3D technology and deliver "right- first-time" design.' Increasing productivity While this standardisation improved design efficiency and working practices, Pöyry realised that PDMS's ease of customisation would provide further opportunities for increased engineering productivity. It also enables Pöyry to use a common component catalogue across all projects, and easily manage it across multiple sites. 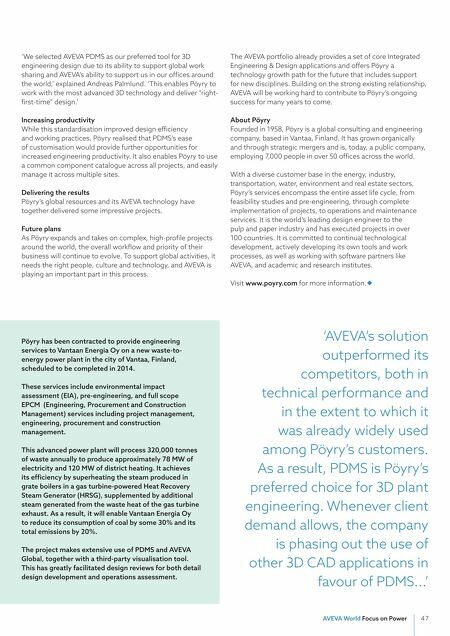 Delivering the results Pöyry's global resources and its AVEVA technology have together delivered some impressive projects. Future plans As Pöyry expands and takes on complex, high-profile projects around the world, the overall workflow and priority of their business will continue to evolve. To support global activities, it needs the right people, culture and technology, and AVEVA is playing an important part in this process. The AVEVA portfolio already provides a set of core Integrated Engineering & Design applications and offers Pöyry a technology growth path for the future that includes support for new disciplines. Building on the strong existing relationship, AVEVA will be working hard to contribute to Pöyry's ongoing success for many years to come. About Pöyry Founded in 1958, Pöyry is a global consulting and engineering company, based in Vantaa, Finland. It has grown organically and through strategic mergers and is, today, a public company, employing 7,000 people in over 50 offices across the world. With a diverse customer base in the energy, industry, transportation, water, environment and real estate sectors, Pöyry's services encompass the entire asset life cycle, from feasibility studies and pre-engineering, through complete implementation of projects, to operations and maintenance services. It is the world's leading design engineer to the pulp and paper industry and has executed projects in over 100 countries. It is committed to continual technological development, actively developing its own tools and work processes, as well as working with software partners like AVEVA, and academic and research institutes. Visit www.poyry.com for more information. 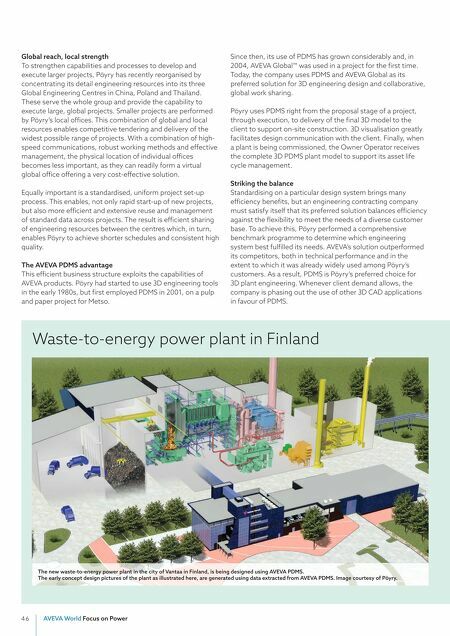 Pöyry has been contracted to provide engineering services to Vantaan Energia Oy on a new waste-to- energy power plant in the city of Vantaa, Finland, scheduled to be completed in 2014. These services include environmental impact assessment (EIA), pre-engineering, and full scope EPCM (Engineering, Procurement and Construction Management) services including project management, engineering, procurement and construction management. This advanced power plant will process 320,000 tonnes of waste annually to produce approximately 78 MW of electricity and 120 MW of district heating. It achieves its efficiency by superheating the steam produced in grate boilers in a gas turbine-powered Heat Recovery Steam Generator (HRSG), supplemented by additional steam generated from the waste heat of the gas turbine exhaust. As a result, it will enable Vantaan Energia Oy to reduce its consumption of coal by some 30% and its total emissions by 20%. The project makes extensive use of PDMS and AVEVA Global, together with a third-party visualisation tool. This has greatly facilitated design reviews for both detail design development and operations assessment.